There might be more that would be useful. If you need something in particular, let me know in the comments and I’ll see if I’ve got it. Otherwise, have fun! I’ll probably be eating ice cream in the interim. My previous Miresua word for he/she was hun. That kept making me think of Attila the Hun, so I decided I better modify it. Both Basque and Finnish use one pronoun for he and she. Miresua follows their example. This Miresua conlang word has been changed. The word for he/she is now här. Smashwords Came Through This Time! "The War of the Stolen Mother" is now available on Smashwords for all EPUB readers (Nook, Kobo, etc. ), as well as Kindle.mobi, PDF, and all their other formats. This time it was a piece of cake! The meat grinder didn't even quibble about my embedded footnotes with the smaller fonts and the asterisk dividers. Posted in grammar | Comments Off on Smashwords Came Through This Time! Last week was another book sale at my library. I picked up a Teach Yourself Colloquial Arabic and one other. I found the colloquial Arabic interesting since it did not use Arabic script for the Arabic phrases. Instead, the book uses romanization. This may come in handy when looking for some conlanging inspiration, so that’s now in my personal collection. The volume also includes translations of Farmer Giles of Ham, Leaf by Niggle, and Smith of Wooton Major, all with different illustration styles. Farmer Giles includes the well-known artwork of Pauline Baynes. 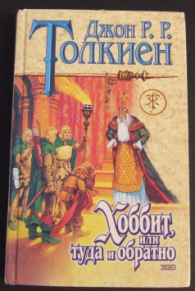 Last year, I passed up a complete collection of The Lord of the Rings in Russian and still kick myself. No, I can’t read Russian, but it’s very interesting to be able to see how names and other items (e.g., maps) are handled in other languages. I know just enough Cyrillic to be able to puzzle out individual words and names. 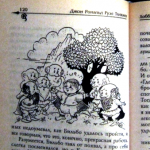 Хоббит, или Туда и обратно is also illustrated in the manner of a children’s book. 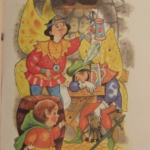 While The Hobbit could be considered a children’s book, the illustrations seem at odd with the sometimes dark themes of the story. 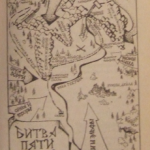 For example, here’s an illustration of the dwarves and Bilbo: The book also includes some nice maps, such as this one of the Battle of Five Armies: (You can see the arrows denoting where the orki are coming from.). Finally, one of the more disturbing pieces from the book are the elves which have wings. Yes, wings: This is obviously the scene with Bilbo finding the way out of the Elven King’s halls through the empty wine barrels. But those wings… That’s a new one. Even so, it’s interesting to get a new perspective on the adventures of Бильбо Бэггинс, Гэ́ндальф, Торин and all the rest. Calling All Anthropologists, Entomologists, Mythologists, Folklorists, and Linguists! This post is a piece of shameless self-promotion! It's about the type of reader whom I would like to attract -- who I believe would appreciate my writing and enjoy it most. This reader could be any of the above, as well as non-experts who nevertheless have a curiosity or a passion about those subjects. Or, in fact, it could be anybody whose interest is piqued by the unusual or the thought-provoking. My books vary in their emphasis. The anthropology angle is obvious in the two volumes of "The Termite Queen"; my heroine is an anthropologist, and first-contact situations require an anthropologist's touch. Anthropology is the central focus in "Monster Is in the Eye of the Beholder." The plot deals with what can happens when an anthropological investigation goes seriously awry. The books in the series "The Labors of Ki'shto'ba Huge-Head" are less directly anthropological because they are laid among the extraterrestrial termite race itself and include only peripheral interraction with those meddlesome Star-Beings. They are more a venture into constructed culture. Entomology plays no role in "Monster," but obviously none of the other books could have been written without a study of insects. The lead male character in "Termite Queen" is an entomologist and the extraterrestrials are giant termites, who have evolved intelligence but still retain many of the imperatives of social insect behavior. I do have the attention of one leading termite expert, Dr. Timothy G. Myles, who wrote that great University of Toronto website about termites, which is now only available in the Internet Archive. Dr. Myles really likes my books! He wrote a 5-star review of "Termite Queen," v.1, at Amazon under the appellation of "Termite Tim." When I first started to use Twitter, I tried to attract the attention of anthropologists and entomologists, and I have periodically attempted the same since then, especially with the entomology. I have never gotten one follow from an anthropologist, and almost nothing from entomology tweeps, except for @BeesinArt, which is very nice about retweeting. I've also had slight interaction with @AboutInsects, and a few others that I can't recall right now. But I can't say that any of this has ever gotten me a sale. Can it be that anthropologists and entomologists don't read SF or fantasy? I can't believe that's true of all of them! Well, all I can say is, they don't know what they're missing! Then there are the mythology people, folklorists, etc. I can't imagine that people interested in Greek myth or any myth, for that matter, or in epic tales (because later volumes retell certain medieval stories -- it's not all Greek) -- that these people wouldn't be intrigued by retellings of their favorite subjects in such an original milieu. Hercules as a giant termite! The Trojan War fought between termite fortresses! Achilles a mighty Warrior who is immature, bellicose, and unpredictable, with a secret flaw (doesn't sound so far from the original, does it?) 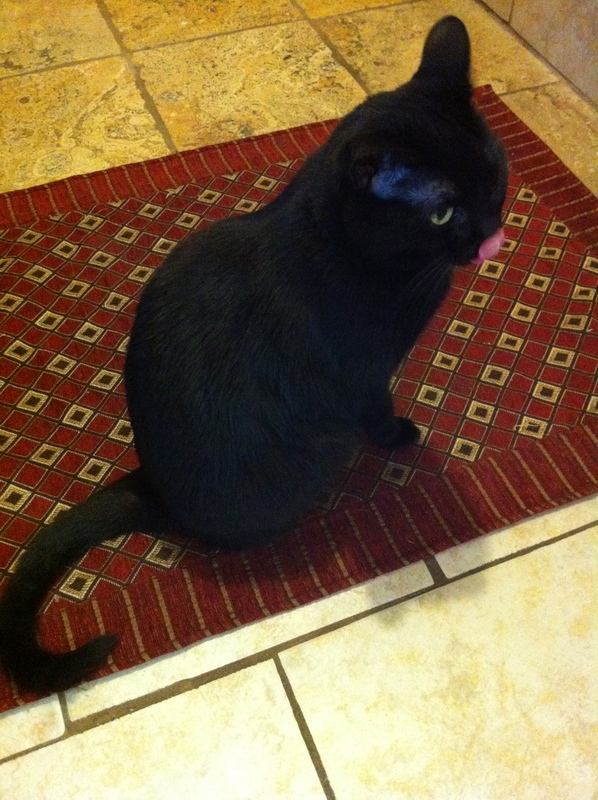 Hecuba a termite Queen! Priam an unnaturally warlike King! Cassandra a mad Alate Seer! The role of Odysseus played by an audacious trickster Worker! Aeneas carrying on his back, not his father, but a young King destined to be the founder of a new fortress, just as Aeneas is purported in some myths to be the founder of Rome! How could anybody interested in myth resist that? It's so much fun -- it was fun to write, and it will be fun to read! Furthermore, while "Termite Queen" doesn't retell a myth directly, one of the great myths of our culture is touched on obliquely in the conclusion of the tale. Last but certainly not least, there are the linguists, particularly those who are concerned with conlangs and concultures. "The Termite Queen" is predicated on a conlang -- Kaitrin Oliva has to write one in order to conceptualize the non-vocal language of the termites. And that language plays a continuing role in the "Labors" series, with Shshi words often utilized in the text (frequently with explanatory notes). I have quite a few contacts already in this linguistic area and I hope to build more. So maybe this post will attract some attention -- maybe somebody will search the terms in its title and find it and think, Huh, that sounds interesting -- I think I'll have a go at one of her books. If so, you can read sample chapters of "Stolen Mother" on this blog, or go to Ruminations of a Remembrancer to read chapters of "Termite Queen." The Amazon link is another place to go - the "Look Inside" function has now been activated on all the books. And Smashwords has sample downloads on "Monster" and on both volumes of "Termite Queen." Happy reading! I hope you will enjoy my books as much as I enjoyed writing them! Posted in grammar | Comments Off on Calling All Anthropologists, Entomologists, Mythologists, Folklorists, and Linguists! Apparently, the Basque word I used previously for lake, laku, wasn't the best word for lake. Although laku is a valid Basque word for lake. My previous Miresua word for lake was jaru. I made my new word similar. Or something close to that, anyway. In honor of the Olympics (though not really in honor of the Olympics), I thought I’d go over a very small, very specific bit of Dothraki grammar. You see! (Oh, how I’m glad you can’t see what that exclamation point was just reduced to on my screen…) True, the parens are mostly there, there are commas galore, and you can kind of make out the periods, but what of the apostrophes?! Where have they gone? WHERE ARE MY APOSTROPHES?! Man, when I get them back, I am so saying dracarys! I don’t know where he slept. I saw who ate the sausage. We’re deciding when to come. Anha tih mahrazhes fin adakh ninde. The word mahrazh, “man”, is put in the accusative case, because it’s the object of tih, “saw”. Fin, “that/who”, is put into the nominative case because it acts as the subject of the embedded verb adakh, “ate”. So far so good. Anha tih rekakes fin adakh ninde. This basically looks exactly like the first sentence, but now the pronoun rekak, “that one”, stands in place of mahrazh. Additionally, since the pronoun is used conventionally in these contexts, it can often be used without fin—and often in either the case it would take in the embedded clause or the matrix clause. Anha nesok rekke remek me. Now there’s no need for fin at all (indeed, using it would be ungrammatical [or at least bizarre] at this stage) and rekke acts a lot more like “where” in the English translation. The same can be done with arrek (best translated as “when” in such sentences). For “how” and “why”, there are two constructions that can be used, but are nevertheless rare (usually the sentence is just reworded). Those terms are: kirekhdirgi “why” and kirekosi “how”. Look at that little pink tongue! What a cat she is! My previous Miresua conlang word for apple was samena, a word I did only a couple months ago. After some thought, I decided to change this word slightly, and use the G from the Basque word instead of the M from the Finnish word. "Stolen Mother" Now Published on Kindle! I published Volume I of "The Labors of Ki'shto'ba Huge-Head" on Kindle just this morning. It should appear on Amazon by tomorrow morning at the latest. The price is $3.99, the same as all my full length novels. It's a great read for that money, and I hope you'll check it out! In the meantime, read the sample chapters included on this blog. I didn't include the map in the Kindle version. Not only could I not make the upload work -- I decided it would be illegible at that size, anyway. I suggest that you download or print yourself a copy of the map from this website and keep it handy. I really don't mind! Next up ... Smashwords! The format will need some minimal tweaking, but without the map or much in the way of odd characters, I think it should work all right. Posted in grammar | Comments Off on "Stolen Mother" Now Published on Kindle! You are currently browsing the Conlangers blog archives for July, 2012.